Grab yourself a bit of the Gilsland Life - with a Holiday Home of your own! GREAT DISCOUNTS OFF THE LAST REMAINING 2017 STOCK. A Great Deal on the last remaining stock of 2017 Holiday Homes - includes 10% DISCOUNT off RRP, FREE SITE FEES until 31st March 2017. Pay your deposit before 31st Dec 2017 and also enjoy 50% discounted 2018 Site fees due April 2018. Why Buy a Holiday Home at Gilsland Park? A Holiday Home is a great lifestyle investment for you and your loved ones. HAVE YOU VISITED THE PARK? GOT TO KNOW THE OWNERS AND MANAGERS? MET OTHER OWNERS ON THE PARK? Visit the park, meet the team and receive a tour of the park and the brand new holiday homes. The office is open 7 days a week - restricted winter timings. Please give us a call, we are happy to answer any of the questions you may have and provide you with a quote. DECIDE WHETHER THE PARK AND NORTH BERWICK FEELS RIGHT FOR YOU? CHECK OUT THE PARK'S FACILITIES AND EVENTS ON THE PARK. Gilsland is all about enjoying good old fashioned family fun and the outdoors. So, to that end, we have a play ground, communal BBQ spaces, a book and toy library and lots and lots of grass and outdoor space for the kids to be kids and run around and play! And hopefully, this all takes place whilst Mum, Dad or Granny and Grandpa sit and relax whilst enjoying a coffee and the paper! The facilities we don't have - are a bar, bingo/slot machines or a swimming pool. We like to keep it peaceful and find we simply don't need them. Situated just on the edge of North Berwick – an easy 7 minute walk takes you to the Sport Centre where you can enjoy the Swimming Pool, Gym, Badmington and indoor trampolines amongst other keep fit classes and clubs. Then another 5-10 minutes walk from there will take you to the High Street where you can enjoy a whole host of Shops, Galleries, Cafes, Bars and Eateries not to mention the Beaches and Harbour - all right there on your doorstep. HOW LONG IS THE HOLIDAY PARK IS OPEN? 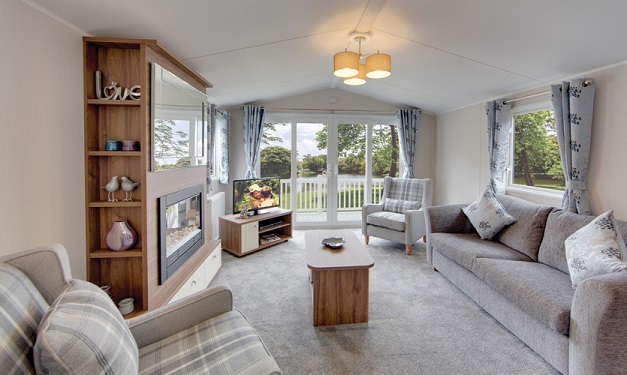 Gilsland Park is open from 1st March through to the 7th January each year, giving you plenty of opportunity to use your holiday home through out the year - even at Christmas and New Year! HOW LONG YOU CAN SITE YOUR STATIC CARAVAN ON YOUR PITCH. Gilsland offers a 12 year licence from new, thereafter there is an annual contract available, assuming the Holiday Home remains in good condition inside and out. We are very proud of the fact that we have enjoyed the company of customers for many, many years. Some of our current customers were not just customers of our uncle but our Grandfather before that. We always try to do our best for our customers and are always happy to discuss part exchange for existing customers that wish to upgrade. Caravans are not like they used to be – they truly are a home from home. Spacious open plan lounges often with patio doors out to sun decks; Large fully equipped kitchens –no longer do you need to pump the water to the sink with a foot pump and some even have Dishwashers! Central Heating and Double Glazing means they are warm and usable all year round and there’s no more running to the toilet block in the night – as they are all fully plumbed in. Most Holiday Homes now have 2 toilets but some have baths and ensuite shower rooms also! The Avonmore is a great buy but if it isn't quite right for you, we also have 2018 models due on site soon and we can get any make or model from all the main manufacturers - just let us know what you are looking for.